Queensland-based Sunland Group is in the final throes of running its ruler over one of the most significant parcels of undeveloped land in the heart of the Gold Coast - the 42 hectare holding of the former short-listed site for the Gold Coast’s convention centre. If Sunland seals the deal, it will be its single biggest acquisition in recent times, with an estimated worth of $70 million. The developer of Q1 and Palazzo Versace, Sunland is believed to have trumped a throng of Asian investors and major Australian institutions that had been circling the Lakeview site at Mermaid Waters. Over the past five years, Sunland Group has spent between $60 million to $80 million a year on multiple acquisitions to top up its development land bank. Last year, it claimed the ABC’s abandoned Brisbane studio complex on a 1.5 hectare site at Toowong for $20 million, which is now earmarked for a $420 million three-tower project. Recently, Sunland secured the 4.7 hectare Palm Beach Mobile & Tourist Park at the southern end of the Gold Coast for $18.4 million, with plans to redevelop the site with a $136 million residential project. The Lakeview site, located on a corner at the intersection of Bermuda St and Nerang-Broadbeach Rd, is part of a portfolio of national assets put on the market by the Sydney-based Scheinberg family. As part of its portfolio offering, the Scheinberg family is putting up a 143 hectare holding on the Redcliffe peninsula, north of Brisbane, where it has been in development since 1970. The Isles of Newport site at Scarborough has approval for 1262 dwellings and is understood to be under due diligence by a major interstate-based property group. 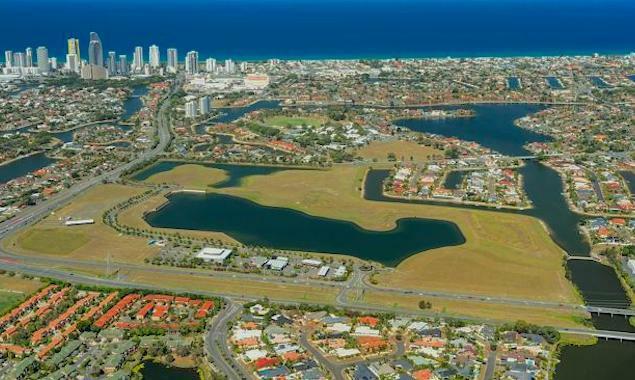 The Scheinberg family’s Mermaid Waters parcel is held via Leslie Corporation and was acquired 42 years ago as part of a 202 hectare dairy farm buyout negotiated by Gold Coast real estate identity, Max Christmas. It features a man-made lake at its centre and has a preliminary approval in place for an integrated mixed-use project comprising 1425 apartments and 37 waterfront residential lots. Approved building heights range from 3 to 10 storeys, also with an opportunity to develop a commercial/retail component of up to 24,000 square metres. The landmark site is already partially occupied by near 3,800 square metres of facilities leased to a gym, service station, car wash and food outlets. The tenancies generate a holding income of about $13 million a year. As one of three sites shortlisted in 1999 for the Gold Coast’s convention centre, the holding has sat nearly untouched since a Broadbeach site next to Jupiters Casino was chosen as the centre’s preferred location. Chinese-backed Ridong, the group behind the proposed triple tower Jewel project at Surfers Paradise, surfaced as a potential buyer in 2011-2012 but left after its offer of about $60 million for the site was reportedly knocked back by the Scheinberg family.